The Allison Wonderland: it's really pretty sad (or SAD) at this point. Let's clarify: That's a self diagnosis (I decided) and I for sure have seasonal depression (WebMD NEVER lies). Seasonal depression during December? No. Right now. Mid summer. I am and I have SAD. The weather around here, let's just say it, has finally gotten to me. I'm going to a wedding in about an hour and bringing a jacket, possibly an umbrella, maybe a blanket and a parka. I know, that couple, they were pretty risky planning an afternoon wedding in July. Or not, because it should be LOVELY today. Lovely, I tell you. Instead, it's 60 degrees and raining. Mid July. We had to turn the heat on in the house because it was basically at an ice box/homeless level in here. Seattle forecast for the week, looks AMAZING. The 6-10 day is actually more depressing. Ok, so beggars not choosers, yeah yeah yeah, I know, but two days of 70 degree weather is not really going to cure SAD. The vitamin D content on a partly cloudy 70 degree day in Seattle just isn't going to do much for me. I'm better off popping pills from Trader Joes to get my "D". I know I should be grateful for these two glimpses, but really, they kind of tick me off. 70 degrees is May weather. It is not July weather. Boo. It's pretty typical of every stinking jeans and a t-shirt day this summer. No, that isn't the sky over exposed behind the tree. That's a blanket of clouds that's been raining on us all day. I'm losing my mind. 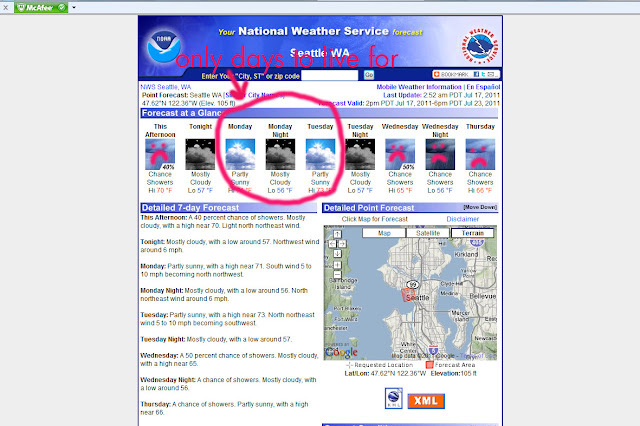 I have lived in Seattle my whole life, but this, this is the worst it's ever been. Ever. Excuse me, but I need to go bundle up for the wedding and I'm thinking I better pull out my winter clothing box. I'm letting out my anxiety via my art (also known as the chalk board). Hood Pool Party 7-24. Beverages supplied, nothing but sun and good friends!!! We will pull out the futon and you can bring "old Black Jack" too! !